LOS ANGELES–The NAACP Image Awards will celebrate the accomplishment of people of color in the fields of television, music, literature, and film and social justice at the 50th NAACP Image Awards. The awards ceremony will air live on TV One, a division of Urban One, Incororated, on March 30. For the first time, the telecast will take place at the Dolby Theater in Hollywood, according to a released statement by NAACP National Board of Directors Chairman Leon Russell, NAACP President and CEO Derrick Johnson, Chief Executive Officer, Urban One, Inc. and Chairman/CEO, TV One Alfred Liggins and TV One General Manager Michelle Rice. In addition to the live telecast, TV One will also air special programming honoring this year’s nominees and spotlighting significant moments. The network will provide promotional support for both programs on TV One, Radio One and Reach Media, Interactive One, and via a multi-platform marketing campaign. 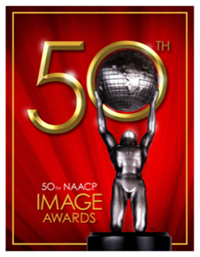 “The 50th Anniversary of the Image Awards represents a major milestone in bringing visibility to the outstanding achievements of African Americans in entertainment, literature, and arts, as well as the NAACP’s ongoing advocacy for equality of opportunity in our society without regard for race,” said the NAACP’s Derrick Johnson. “We are sincerely grateful for our continued partnership with TV One and look forward to working with them on the 50th anniversary show, added Johnson. The multi-cultural show is one of the most respected events of its kind and is well attended by many of the top names in the entertainment industry. Previous telecasts included stellar talent such as Oprah Winfrey, Will Smith, Taraji P. Henson, Viola Davis, Gabrielle Union, Kerry Washington, Anthony Anderson, Sterling K. Brown, Mandy Moore, Halle Berry, Common, Dwayne Johnson, Steve Harvey, Audra Day, John Legend, Tracee Ellis Ross, David Oyelowo, Laverne Cox, Octavia Spencer, Issa Rae, Chadwick Boseman, Terry Crews, Yara Shahidi, Danai Gurira, Isaiah Washington, Jacob Latimore, Jay Pharoah, Jemele Hill, Josh Gad, Loretta Devine, Michael B. Jordan, Sylvester Stallone, Jurnee Smollett, Meta Golding, Michael Smith, Tyler James Williams, Ava DuVernay, Chadwick Boseman, and many more. The production team will be returning including Executive Producers Reginald Hudlin and Phil Gurin, Tony McCuin as Director, Byron Phillips as Co-Executive Producer, and Robin Reinhardt as Talent Producer.